He said the second vote on the prime minister’s deal last week was “in order” as it was substantially different to the first, but any further votes must pass the “test” he had set out to be allowed. The BBC’s Laura Kuenssberg said the Speaker’s intervention could have a “massive” impact on the Brexit process. 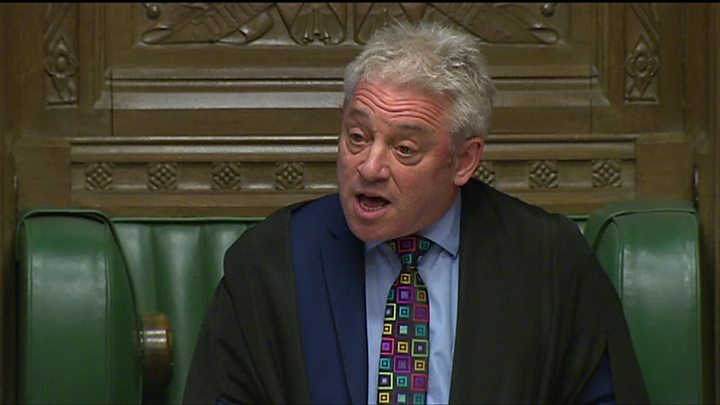 The prime minister’s official spokesman said Mr Bercow “did not warn us of the contents of the statement or indeed the fact that he was making one”. The prime minister had been expected to bring back a third vote on her Brexit deal this week – a week after MPs rejected the agreement for a second time by 149 votes – and ahead of the EU summit on Thursday. Last week MPs also backed plans to rule out leaving the EU without a deal, and they voted in favour of an extension to the process. Brexit minister Kwasi Kwarteng told MPs on Monday that Mrs May would write to European Council President Donald Tusk to ask for a delay. If the EU agreed to the request for a new exit date, the government would ask both Houses of Parliament to approve the change, he said. He suggested “there were ways around this” – including potentially cutting short the current session of Parliament to an end, a move which would lead to calls for a general election. Brexit: what do we know?